Legendary coach John Wooden used to say the bench is a coach’s best friend. A new coach means a new best friend for USC basketball players to try to avoid getting to know. Interim head coach Bob Cantu only had three days to prepare for his first game replacing Kevin O’Neill, and he has therefore avoided making drastic midseason changes. Nevertheless, some players are playing more, while others have become more acquainted with Cantu’s new best friend. O’Neill had a love-hate relationship with J.T. Terrell, as Marshall Kelner recently wrote. Through the first eight games of the season, Terrell averaged 29.5 minutes per game. Terrell then fell out of the rotation the next eight games. His minutes during that stretch fell to 14.4 minutes per game, including a DNP-CD against California. Terrell is back in fold with Cantu at the helm. Terrell only spent a total of nine minutes on the bench during Cantu’s first two games as head coach, averaging 16.5 points per game. 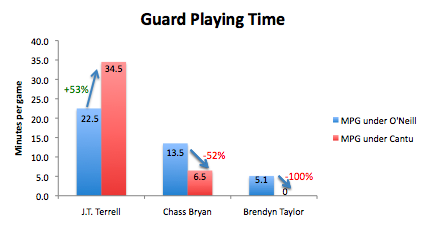 With Terrell averaging 34.5 minutes and point guard Jio Fontan playing 33.5 minutes under Cantu, there have been few opportunities for backup guards to play, and the minutes of Chass Bryan and Brendyn Taylor have suffered. Cantu has yet to insert Taylor into a game. Note: minutes per game is calculated by dividing total minutes by the total number of games under each coach (17 games under O’Neill, two games under Cantu). DNPs are counted as zero minutes for that game. 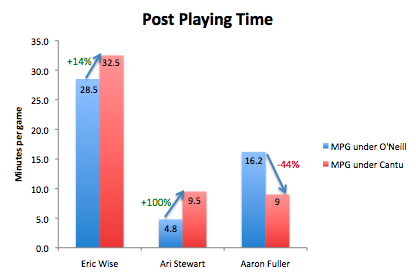 Eric Wise played a lot of minutes under O’Neill, and he has continued to play even more under Cantu. USC’s leading scorer only sits for an extended period of time when he gets into foul trouble. He has recorded three or more fouls in 11 of 19 games this season. You were more likely to see Ari Stewart on a milk carton than on the Galen Center court during O’Neill’s final days as coach. Stewart played a total of 13 minutes during O’Neill’s last nine games, including seven DNPs. Under Cantu, Stewart has played off the bench. In the game against Oregon State he scored his first points since November 25. Aaron Fuller’s minutes have decreased under Cantu, but that could be changing. When Dewayne Dedmon fouled out against Oregon State, Cantu inserted Fuller into the game instead of Omar Oraby. Fuller responded by scoring what proved to be the game-winning shot.